What an unbelievable game! That pass play on second and goal by the Seahawks will go down in history as the most bone-headed call of all time. And Tom Brady will be remembered as the greatest quarterback to ever play the game! What a nail-biter….that game took a few months off my life. This puts an end to Brady v. Manning. This puts an end to the best NFL team of the 21st century. It puts an end to Patriots only win by cheating. I still think Butler should’ve gotten the MVP, though. When it was over I told the folks at the SB party I was at that I had to head home and get my blood pressure medication! Brady deserves the MVP though – he engineered the comeback from a 10 point deficit in the 4th quarter. Butler should have knelt down in the end zone, bringing the ball out to the 2 almost made it very messy, especially after a post-possession penalty pushed them back to the 1 yard line. Everyone around me was celebrating, and I’m shrieking about trying to take a knee from the 2-yard line. It was wonderful to see the game end with the player praised to the skies by Collinsworth blowing the final play with the penalty. That is what I originally thought as well. But it’s wrong! Butler did exactly the right thing. If you look carefully at the video, you can see that Butler actually caught the ball outside the end zone – one foot clearly lands outside the goal line, and the other might have landed right on the line. His momentum then carries him into the end zone. So if he takes a knee there, the best case is that the Pats get the ball where he caught it (on the 1-yard line), and the worst is that the Seahawks are awarded a safety (I think it depends on how the refs see the play). In any event, no touchback, so trying to run it out was the right thing to do. Brilliant. He might have been able to down it in the end zone (momentum) for a touchback, but maybe not. And if we can’t be sure seeing it on the replay knowing the outcome, its hard to imagine that Butler would know in live action. There was no reason to guess there. Butler was right to take it out. As I read the rules (section 5, “Safety”), if a defender intercepts a pass outside the end zone and then momentum carries him back into the end zone where the ball then goes dead (e.g., the intercepting player is tackled), the intercepting team gets the ball at the spot of the interception (in this case roughly the 1 yard line), not at the 20. A touchback only occurs when the ball is actually caught in the end zone. I wrote my above comment just before hitting the sack – I had set my DVR to record the game, so I watched it again this morning. I thought he had caught the ball in the end zone, but that wasn’t the case. A few times. Let’s not overlook the fact that 4/5 of DBs would have quit on the play with Kearse, thinking the pass had been broken up. Butler was smart enough to realize the ball was still live and push him out of bounds. Agree there. If he wins one more (improbable but not impossible) than he is definitively the greatest of all time. As is-no gate bars his entry to the hall and above Manning. is already very good, whether or not he wins another. His ‘window’ hasn’t closed, though, and the NFL has made it easier and easier for great QBs to stay in the game. I see no reason why he can’t play at an elite level for another 2-3 seasons. If the Pats keep Revis, Gronk stays healthy, Edelman continues being the new Welker, I see no reason why the Pats can’t win another. but it was an amazing game, with many amazing plays and players… so not the easiest decision. The Ninkovich sack on Wilson changed the entire game. Prior to that, Wilson was in control. After that, he couldn’t get rid of the ball quick enough. That’s what a Ninkovich hit will do to you… and that’s what happens with an inexperienced QB. Brady was sacked also, not long after the Ninkovich hit on Wilson, but he shook it off and won. That’s what happens with an experienced QB. And my Bears lovin fiancee and Rodney Harrison agree with us, but there is a strong argument to be made that while Brady was a game manager the first three quarters he exploded into his old self the last quarter and really sealed the deal by opening up the lead and scoring as rapidly as he did. Edelman and Brady separately said the whole team should share the MVP award-it really was a balanced team effort. As was Seattle. This was the NFL at it’s finest in terms of two well balanced teams giving us a great game. Best Superbowl I’ve seen. When the Patriots came onto the field as a team, and insisted on being introduced that way and not as a line of individual star athletes? I seem to recall Rush Limbaugh or someone being all angry about the elevation of the team as such over individual achievement, and wouldn’t somebody please Think Of the Children?! But that aside, if there were ever a case for not trying to choose an MVP, it was surely this game. Everybody’s a star. Some more than others, certainly, but the Butlers and Bradys and Edelmans wouldn’t glitter so without the extraordinary work from everyone else on and off the field. It’s nice that all of them seem to understand that, and to want us to understand it too. We’re so proud of our Patriots. What amazing team spirit! There’s a great lesson to take away from this victory and for me it was summed up best in a poem written by my late aunt,Betty Rich,and published around the world as an inspiration to all those facing challenges in their lives. The appropriate response to poor sportsmanship is not more poor sportsmanship. The decision to call a passing play on that down was a fine call. There are plenty of TD passes of 3 yards or fewer. It was even a decent play. Butler just made a great play in breaking to the ball. In the NFL, a great play often beats a good playcall and a good play. I don’t think you will find very many fans or sports writers in Seattle that thinks that they should have passed the ball there, especially into the middle of the field. I don’t think it is bad sportsmanship to critique the playing calling of either side after the game. I got into some debates with sore loser fans of the other 31 teams in the NFL (who were rooting for Seattle since they hate us cause they aint us). Anyway, they argued it was a gift that they made that call. But Carroll admitted that our defensive formation scared the hell out of him, we were very successful stopping Lynch all game, and we could have stopped him there. Nobody saw Butler, if you look at the footage from the angle of Wilson throwing the pass you can see that he had two open men he was aiming for and Butler snuck right in on the middle. Smart play by a smart defender. Granted, I think you should run Lynch since you still had enough time to try for a pass next two downs. Carroll likes high risk, high reward plays. His boldness lead to that shocking tying touchdown right before the half, brilliant since they kept possession next play. But it burned him here. Fortunately this debate seems to be getting deflategate off the headlines, now that there is actual football news to discuss. Yes, Lynch did not run totally amok but he was still quite successful at gaining yards including on that drive. From one yard out, it seems like it would have been a better bet. When the game is on the line do you go with the 1# running back in football or a quarterback who probably is not in the top ten in the league against one of the best secondaries in football? I know what I would do. And if you are going to call a pass play, why throw to the middle? There are just too many things that can go wrong. In any case, whether the call was a reasonable one or not, it definitely deserves to be called into question. And there is no question that even if it was a bad call, it only turned against them because of Butler’s incredible instinct and perfect execution. We had him pretty well guarded first two and a half quarters, but I was scared shitless on that play and was shocked how it ended. Happily shocked, cause I definitely thought our goose was cooked after the miracle catch and Lynch getting them to the 1. I feel bad for Wilson, who is a genuinely exciting Quarterback to watch and seems like a decent person off the field, he had to have taken that pretty hard, but I agree that Butler deserves more of the credit than Wilson deserves the blame. It wasn’t his call after all, and it really seemed like nobody but Butler saw that play coming. Seattle will be back, possibly as soon as next year. All the big NFC teams will be rebuilding for the most part, they seem like the only ones ready to roll week 1 with the system they have. They will have to pay big money for Wilson and Lynch-but few would argue with that. I think this was our last best shot at another win so I couldn’t be happier with the outcome. Too. It’s clear Wilson wasn’t really seeing the full field with that one. It was a terrible call to pass then by the coaching staff, especially with their running game, but Wilson shares in the blame for making that throw, too. it only turned against them because of Butler’s incredible instinct and perfect execution. And the fact that he paid attention during game prep. 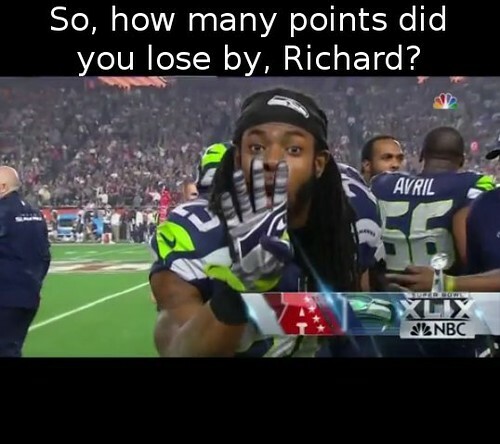 And credit Butler and the Patriots for doing their homework. They noticed the Seahawks came out in their three-receiver set, with Jermaine Kearse and Ricardo Lockette stacked on the right side. “In preparation I remembered the formation they were in — two receiver stack. I just knew they were running a pick route,” Butler said. Sure enough, Kearse ran a clear-out, and Lockette tried to run a quick slant underneath him. But Butler jumped the play perfectly and beat Lockette to the football, hauling in the interception and holding on for dear life. It’s not the right matchup for us to run the football so on second down we throw the ball, really to kind of waste that play. If we score, we do, if we don’t then we’ll run it on third and fourth down. If they were trying to waste a down with a pass play, the last place you want to throw that ball is into heavy traffic. A sideline high pass where only the receiver has a play on the ball would have made sense. It’s not that a pass play was a bad idea (especially given the defense on the field), it was just the wrong pass play to call. Also, I get that there are other places to find this information and that I may be the only person in the state who didn’t watch, but shouldn’t any article about the game lead with the final score (28-24, which I had to Google)? *totally kidding, but it was honestly a compelling game from start to finish even non-fans could enjoy. I even enjoyed the half time show, mainly for my girl Missy Elliot. The commercials were entirely too depressing though. I’ve just never have been a sports fan, and football in particular has always been confusing for me. I can’t imagine “learning” American football; plenty of life time fans are still not sure what constitutes pass interference. I can understand soccer (pretty much, aside from the offside rule), but just can’t get excited about a sport where 3-0 is a blowout. Speaking of words, and going way off on a tangent, has anyone else ever noticed that a lot of sports people (both players and announcers) have a hard time forming an adverb correctly (<- like that)? E.g., "We played physical". Must have missed the "Lolly Lolly Lolly" bit on Schoolhouse Rock. …and I believe he is Harvard-educated to boot! I really wish we could ban “mental toughness” from the lexicon of the game. It’s such a terrible, torrid, turgid phrase that evokes nothing in particularly. Why can’t intelligence work? Or dexterity? Mental acuity is a great phrase that is actually slightly easier to say. Immediately Kraft, Brady, Gronk and Dan Patrick were guilty of this offense to the English language. I’ll forgive them for it-but it still bothers me. But second, “mental toughness” to me means the ability to think quickly and clearly even in the presence of an enormous amount of distraction and pressure. That is not quite the same as any of the other words and phrases you suggest. I don’t have a problem with it. It’s the ability to concentrate and do what you’re supposed to do, under a lot of stress. As David says, it is not remotely the same as intelligence or “mental acuity”. You can be very smart and choke under stress all the time, as many people do. For musicians, “The Inner Game of Music” is one book among very very many, since it’s a critical skill. That book was inspired by “The Inner Game of Tennis.” It’s a cottage industry. And witness the Seahawks’ reliance on the related field of “mindfulness” — they get results. They’re a clutch team — the interception notwithstanding. The difference between the 1986 Red Sox and the 2004-2013 Red Sox, or the ’85 Patriots and 2014 Patriots, is not (just) talent. It’s mental toughness, which Curt Schilling, David Ortiz, and Tom Brady — even, in his own way, Manny Ramirez — possess in abundance. I’d say it’s a team with true grit, doggedness, amazing willpower, and strong mental fortitude and perseverance. All sound better than “mental toughness” which has to be a Maddenism that somehow went mainstream. Great game by our team, a lot of individual players who played phenomenal. Apparently, Boston can clean the streets enough to have a parade tomorrow but not school. Yeah, I know they aren’t equivalent jobs, but it just seems out-of-whack to me. Most of the kids will be at the parade anyway. Many of those kids weren’t alive or don’t remember the last time the Pats won it all… They’re not going to miss it. A convenient excuse to cancel school – so no one’s wasting their time – is uniquely appropriate given the situation, because at least this way no one’s missing an entire day because of a parade, since the day will be made up at the end of the year. Parade postponed. Of course, who knows if they’ll get the schools open by Wednesday. What made him think that tomorrow was a good day for this? While the storm is worse than they predicted, it isn’t that much worse. At least someone talked him out of it. I heard today that the team is only expected to remain in town for 72 hours following the game. Are there players who do not live locally? Boston could throw the parade three weeks from now and most of the players would still probably show up to be in it. This is not the kind of thing most team members will want to miss. It’s everyone’s first Super Bowl (and hopefully no their last!). So I am sure it’ll be a full team with hundreds of thousands of fans. People can complain about Boston winning too much-but the fans always show up every parade. Tom has a house in SoCal and an apartment in TriBeCa (along with a Brookline manse near the Krafts). Gronk likes to go to Long Island and Miami. But, Vince Wilfork lives here all year round, and I’d see him in a parade anytime. By all means cancel school if it’s unsafe, but I cannot more strongly disagree with the idea that school should yield to a sports parade. The Patriots have never won a Super Bowl when MA had a Democrat as a governor. The last was in 2005. They have played the Super Bowl since then though, right? When the Patriots won their first super bowl I was still in high school. My mother didn’t let me go to the parade. I had classes that day in which absolutely no one attended, the average was about 3-5 per class. It was an absolute waste of my time and my teachers’ time, because it’s not like they could have lessons with 95% of the class out. So I got a full day long, miserably boring study hall. It is far, far better to just use the snow as an excuse to cancel school. No one is missing lessons over it, no one’s time is being wasted – the day gets added on at the end of the year. It is actually the responsible thing to do. Absolutely outrageous IMO that so many of your classmates played hooky. Sure, it can be made up at the end of the year, but for me it’s the principle of the thing. you want to waste an entire day of school? We can debate the morality of whether kids should skip school to go to the Super Bowl parade all we want, the fact remains that a significant number of kids will skip — likely more than half. And that means everyone will waste a day, because teachers aren’t going to go ahead with lessons if half the class is out. This is a reality-based community. We should always strive to do what works, not what sounds or feels good. Teach who shows up, mark the absences unexcused, force kids to make up work or take zeros. Maybe the players’ contracts should extend to the following weekend so the parade can be on Saturday. I have no problem trying to force reality sometimes. The real world requires education, not sports fandom, and despite being able to make it up it’s symbolic and symptomatic of a greater problem with societal priorities. Sorry to say, but your mother was absolutely right. Oh for heaven’s sake. You think kids in other countries don’t skip school to watch their favorite teams play a big game, or celebrate their big win? We like our sports here, but it’s nothing compared to soccer-mania in other countries, as just one example. …but if we valued education here the way other countries seem to maybe I wouldn’t mind an occasional skip day. I will remember that far more than any of the lessons I may have missed. Coming so soon off the low of 9/11, which we all watched live on tv in the classroom when the second tower got hit and fell, it was great to be out in public for such a fun event. Especially since our end of the year trip abroad had been cancelled thanks to 9/11. I referenced it in my graduation speech in similar terms. I also got a kiss from my crush! Imagine how many future memories you are taking away from these kids Christopher-especially those too young to remember the last one. We complain about teachers getting paid too much, but not about multimillion dollar athletic contracts (never mind that teachers require advanced education and contribute to the future of society whereas athletes don’t). We are willing to pay the ungodly ticket prices to see professional games, but not raise our taxes by what amounts to a few cents a day to keep vital academic programs and decently sized classes. When budgets get tight, academic enrichment goes out the window, but somehow school sports gets fully funded. Sports also almost always gets more favorable treatment than more academically-oriented extra-curricular clubs and activities. Our best high school athletes are offered full-boat scholarships to often very good colleges and universities, but those never seem to be available to those with the highest GPAs or members of the quiz bowl or debate team. Even if said athletes struggle academically schools often bend over backwards, sometimes even into unethical territory, to hang on to them. To be clear “we” is generic here rather than referring to me or even possibly present company, but I for one am sick and tired beyond words of the attitudes and actions described in this comment. Kids are going to miss school over this — and in Boston, the majority of students will miss school over this. That’s happening no matter what. Period. So, the question is how do we deal with it? I say we should use the convenient excuse that there’s lots of freaking snow on the ground that still needs to be cleaned up and have another snow day, given the reality that thousands of Boston school kids will skip anyway, and ensure that they don’t all lose a day of school since a day of school will be added to the calendar. Mine is cognizant of it. Your solution pretends to value education with sloganeering, while hurting kids. Mine ensures Boston students don’t fall a day behind school en masse. This debate is a complete waste of time, so I’ll stop here, but your propensity to defy all logic and reality makes my brain explode. Yeesh. So often all we see is the embarassingly long list of countries that seem to outperform us (including the occasional particular country that has no business being ahead of us), plus we’ve probably all had encounters with kids who literally can’t do the math when it comes to things like making change. Brady is spreading the wealth and giving Malcolm Butler, the Patriots hero Cornerback with the game winning interception, the brand new truck he just won as MVP.